White Horses is located in the San Clemente pier bowl.The Place? Mark and Aileen Norris, owners of White Horses Restaurant & Bar.The Owners? The owners are the Norrises, both recently from the United Kingdom; Mark called London his home and Aileen, Ayrshire Scotland, where they previously operated a restaurant. Mark, a restaurant designer, chef and operator, has designed and opened over 40 restaurants. Settling in America had been a longtime dream for them, and San Clemente met every hope they imagined. 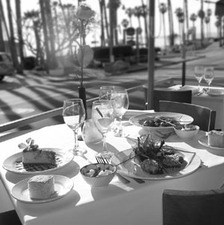 Mark shares the chef duties with Tim Watson, formerly of the Four Seasons in Newport Beach, and Aileen serves as maitre d’. Business has been brisk, praise extensive, and the transition pleasurable. Every eight weeks or so, they redo both their restaurant’s offerings and décor. A new artist’s work adorns the walls; the breads, appetizers, menu items, and everything else not nailed down are changed. Their having doubled the use of the restaurant as an art gallery has been most encouraging to local artists. They’ve exhibited the works of Shane Townley of Studio 405; Trevor Meza, Herman Sillas, and Kirk Saber of the WestEdge studio; Nathan Paul Gibbs, DiAnne Williamson, Danielle Hacche, Howard Kirk, Coleen Hanley, and Jennie Riker. The appetizer list of ten choices starts with grilled lobster and caramelized onion pizza with buffalo mozzarella and fresh basil and includes spinach and almond fritters, orange crab cakes, smoked portabello mushroom carpaccio, pheasant and cognac sausage, meat or vegetarian tapas, and ends with a Spanish platter of cheeses and cured meats and salads to die for, all with their respective exotic sauces and toppings. Appetizers range from $8 to $12. Dinner at White Horses is an ocean view experience.There are two menus to choose from: a concept menu and a grill menu, affording an array of 14 choices unexcelled by most quality eateries. Char grilled lamb chops with a mango, mint and garlic mojo. braised buffalo short ribs, striped sea bass with a rosemary and tomato polenta and a tapenade and tomato sauce, lemon grilled chicken breast with haggis and a malt whisky cream, plantain crusted halibut and charred pineapple salsa, a unique plate of exotic vegetable parcels from Greece, Russia, India and Spain; seared scallops with a grapefruit buerre blanc; roast duck breast on lemon grass skewers with red and green thai curry sauces. For the grill menu, you can choose how the fillet, NY strip, ahi tuna, salmon, chicken or lamb meat is cooked; there are also four marinates, six crusts, eight sauces, and five butters – all totally different and challenging to decide amongst. Main menu items are scaled from $18 to $32, all are served with potatoes and an array of freshly steamed vegetables. Everyone gets a complimentary small cup of soup as a pallate cleanser between courses, a novel and nice touch. If, after appetizers and the main course, you have enough gastronomic room to spare, there are eight choices of desserts: cakes, pies, cobblers, fondue and even a cheeseboard representing the “six cheeses from around the world.” Desserts prices are $6 to $12. The beverage selection is broad with a wide inventory of alcoholic items. 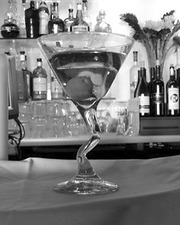 My martini was outstanding, and I especially took delight in the feel of the glass’ stem, which, in the middle, curved into a vertical “v,” providing total control of the valuable liquid. Wines and champagnes represent homegrown name brands, as well as Australia, New Zealand, France, Italy, Spain, and South Africa. Bottle selections span from $20 to $85. Depending on the vintage, a glass of white or red house wine is either $6 or $8. The Norrises lease the restaurant space from long time local, Rick Anderson, who owns the Casa Tropicana Bed and Breakfast Inn. The unique glass is easy to hold.The Experience? 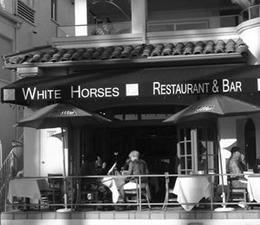 White Horses Restaurant & Bar, 610 Ave. Victoria, San Clemente, (949) 429-1800. open 4:30-10pm, except Mondays. Website: www.whitehorses.us. Early bird special (4:30-5:45 pm, $15).